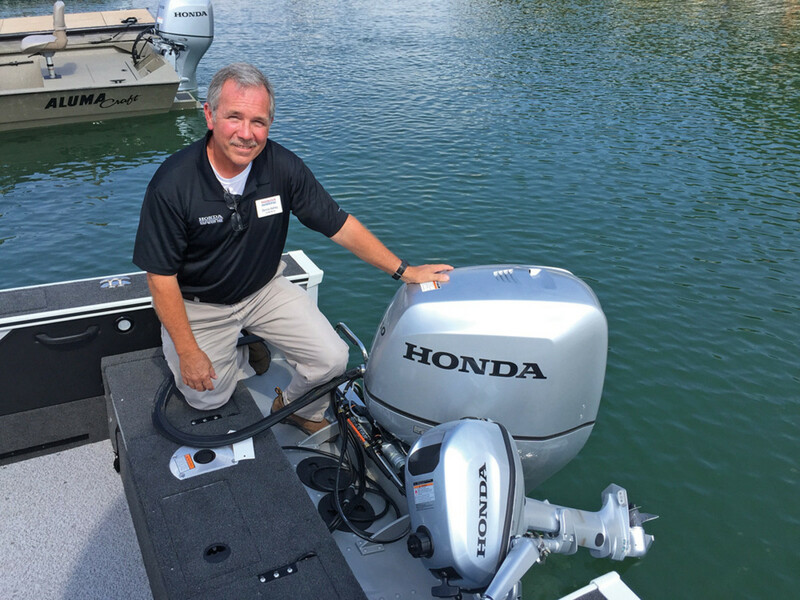 Honda senior OEM sales manager Dennis Ashley was at the media event to outline the benefits of all Honda engines from 4 to 250 hp. 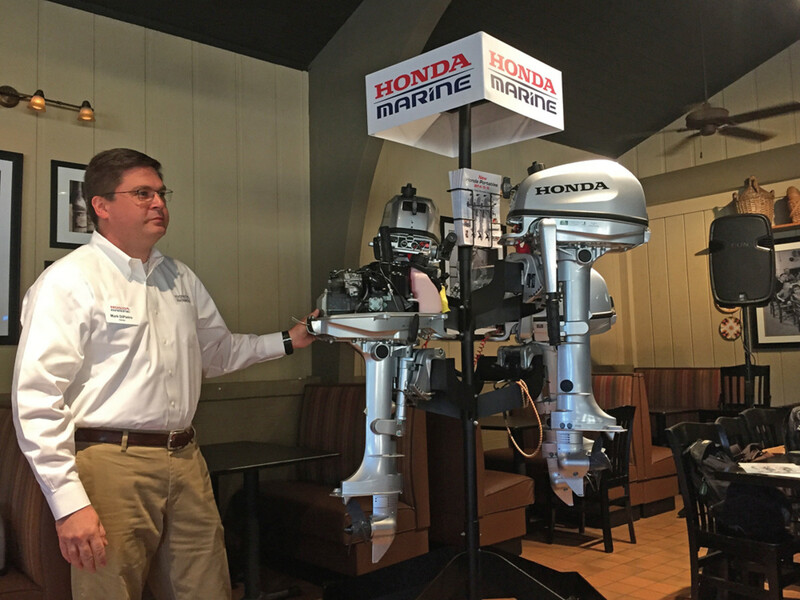 Honda Marine continues to focus on the portable and midrange engine segment, introducing to dealers and journalists this fall a trio of 60-pound 4-strokes at a product introduction and demo event in Buford, Ga. 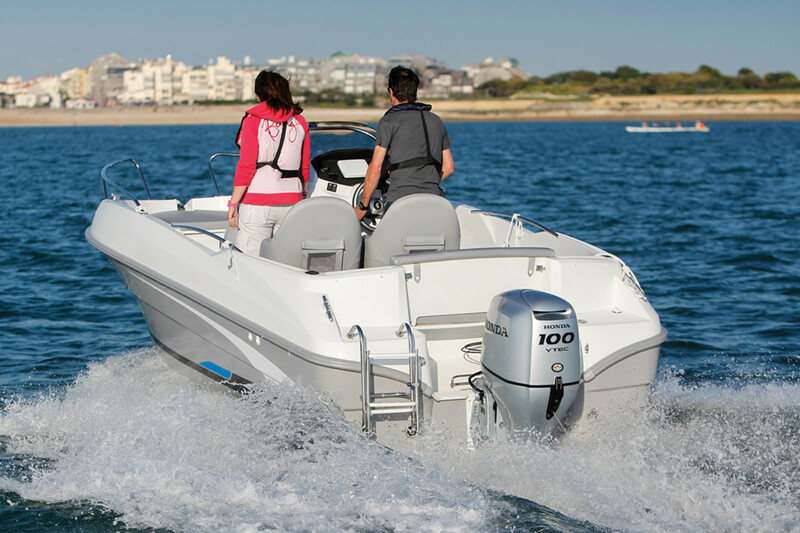 Sales of 200-plus-hp engines have fueled the outboard market, but Honda says it is outpacing the industry with its midrange and portable engine sales. “Our focus has been growing the customer base. By focusing on product development and improving our midrange product and introducing new portable models, we are bringing more boaters,” says DiPietro. The BF 4/5/6 have improved stop buttons and a tiller handle that’s virtually free of vibration. To help achieve this goal, he says, the company has added all portable — BF 2.3 to BF20 — tiller-handle engines to online sales availability through its dealership websites. Honda’s BF225 debuted in 2002, and the BF250 was introduced in 2011. Last year, the BF100 debuted at the 2015 International BoatBuilders’ Exhibition & Conference. The new 4, 5 and 6 were introduced to the industry at this year’s IBEX in Tampa, Fla. The Honda dealer meeting — about 70 dealerships consisting of about 150 people attended — followed the media event. “By holding the media event alongside the dealer meeting we were able to get more boats and engines here,” Southeast regional communications manager Kathy Graham told me. The BF100 was introduced last year. I drove four boats, including an Alumacraft Trophy 185 with a BF150 and BF5 as a kicker. I liked a couple of the BF5’s safety and operational improvements. The tiller arm swings 360 degrees for easy storage.Honda has virtually eliminated tiller handle vibration. The engine powerhead is separated from the tiller handle, so although the engine might be vibrating, the user does not feel it, says Ashley. He’s right — the tiller of the BF5 was indeed steady. In case of an oil pressure drop, a new low-oil alert will limit engine rpm to 2,300, which allows you to continue operation, but at a level that will have less of an effect on the engine.